We often speak of “proper running” and when we invoke this term, its often met with controversy. Its time to put the quibbling to bed. 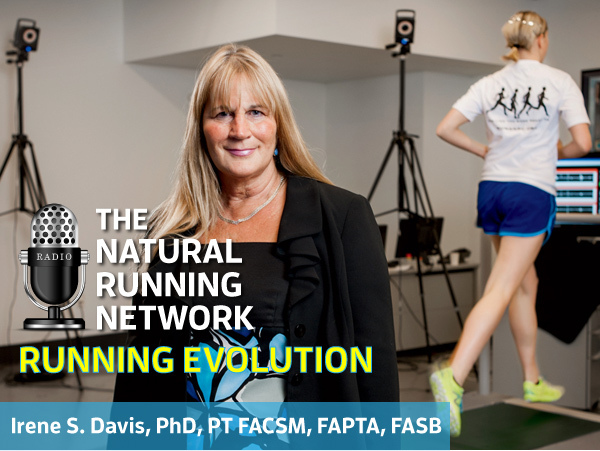 Our guest, Dr Irene Davis is one the most respected authorities on the subject of running biomechanics. She does not pull her punches when it comes to running and what she refers to as “Running Evolution”. For many, this interview will be hard hitting and will at minimum, cause the heel strikers to pause and reflect not only on the way they approach their running but on running shoe selection. Who is Irene Davis? Dr. Irene Davis is the founding Director of the Spaulding National Running Center, Department of Physical Medicine and Rehabilitation, Harvard Medical School. She received her Bachelors degree in Exercise Science from the University of Massachusetts, and in Physical Therapy from the University of Florida. She earned her Masters degree in Biomechanics from the University of Virginia, and her PhD in Biomechanics from Pennsylvania State University. She is a Professor Emeritus in Physical Therapy at the University of Delaware where she served on the faculty for over 20 years. Dr. Davis’ research has focused on the relationship between lower extremity structure, mechanics and injury. Her interest in injury mechanics extends to the development of interventions to alter these mechanics through gait retraining. She is interested in the mechanics of barefoot running and its effect on injury rates, and is a barefoot runner herself. Along with gait analysis, her research encompasses dynamic imaging and modeling. Barefoot running, should you do it, where and how often? Running shoe design, whats the right shoe to wear? Is it okay to heel strike? What is the preferred approach, heel, mid or forefoot stride? This was a great show. I will make another try to barefoot running!